NZ Food Safety Registered Exporter. Lyprinol Soft Gel Caps are an all natural anti-inflammatory. They contain a patented blend of Marine Lipid Oils extracted from New Zealand Green Lipped Mussels. 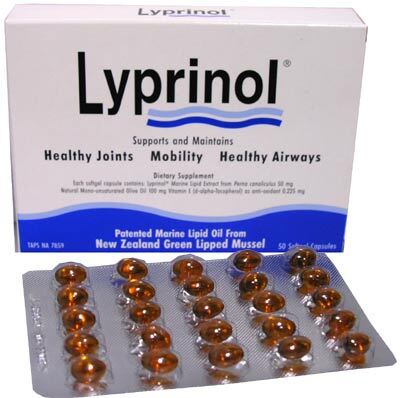 Lyprinol is scientifically shown to be effective at maintaining healthy joints as well as combating the symptoms of chronic inflammatory conditions such as Arthritis. It has also be scientifically shown to maintain health airways and breathing passages. Being a rich source of Omega 3 it is also helpful for your general well being. This product was added to our catalog on Wednesday 21 November, 2012. While stocks last. * Conversion is indicative only. Paid in NZ Dollars. © 2008/2009 BodyBooteek a Trading Division of HCS New Zealand Ltd.
Prices exclude GST, applicable to Sales within NZ only.